Belleville's entry level boot features the same top quality materials and manufacturing as their more expensive models. The Belleville 300 TROP ST Hot Weather Black Steel Toe Combat Boots is constructed from pure leather cowhide and durable CORDURA nylon, a lightweight and breathable fabric. An unlined upper and dual instep vents keep your feet cool and dry in hot operating environments. The 300 TROP ST also features a VIBRAM Sierra outsole that is designed for demanding environments ranging from ship decks to asphalt tarmacs. 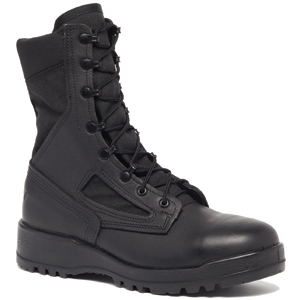 This boot is designed to provide the comfort of a running shoe but durability and performance of a combat boot. This boot is made in the USA with pride. The 300 TROP ST are awesome boots but keep in mind that they run extremely large and wide. About 1 full size so I had to switch to thick wool boot socks to make these fit right. That's okay though because they are really comfortable and designed for hot weather so my feet don't have a problem sweating much. I'l definitely look at another pair of Bellevilles after I run these into the ground. Great value for the price. I bought these boots for my husband who is in construction. He's on his feet all day and crawling up ladders and on his hands and knees. All I hear him talk about now is how comfortable they are compared to his old boots. I followed the sizing recommendation to order one size smaller than his running shoe size and they fit perfect! Also this company shipped out the boots the next day and we received them 2 days later. Excellent service. Thank you! These are excellent quality boots. It took my feet a couple of days to get used to these coming from a pair or Wellcos but thats expected with any new pair of boots. I like the fact these are lightweight and the the width is nice and wide. Another great thing is the non-slip sole which is great for me because I use these boots for projects (mostly car) in my garage. Nice to see we still make quality products here in the USA with everything made in China these days. I highly recommend these boots. Great fit and I followed the sizing guideline to buy one size smaller than my running shoe. Fast shipping from this seller. My boots arrived in 2 days with free shipping and no sales tax. Hard to beat that. I've had these boots for 3 months now and they were comfortable right out of the box. Great arch support and stiff sole which is good for people with flat feet like me. These were a great value as well for $110 for tough boots made in the USA.